Brady Matson (9) of the Fort Macleod Mavericks lugs the puck up the ice against the Beiseker Blazers. 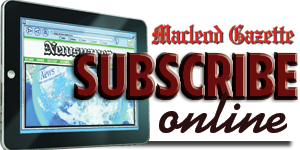 Fort Macleod Mavericks are one win away from the Central Alberta Tier 4 Midget Hockey League championship. The Mavericks edged Beiseker Blazers 7-5 Sunday in Fort Macleod to take a 1-0 lead in their best-of-three championship series. The Mavericks travel to Beiseker for the second game of the series at 6 p.m. Saturday, March 23. The third game, if necessary, will be played at 2:45 p.m. Sunday, March 24 at the Fort Macleod and District Sports Centre. 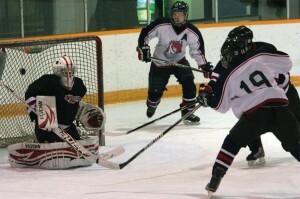 To reach the championship series the Flyers had to first get past the Bassano Stars. The Mavericks had won the first game of that best-of-three series 12-7 on home ice, and had a chance to complete the sweep Friday night at Bassano. The Stars knew their season was on the line and they weren’t going down without a fight. The Mavericks drew first blood just 1:12 into the game when captain Sheh Gallamore scored, assisted by Matthew Warren. Gallamore popped an unassisted marker 3:43 later and the Mavericks were up 2-0. That was all the scoring until the third period as the teams settled into a defensive battle, with Mavericks goalie Donovan Flobert turning aside everything Bassano shot his way. Just 1:50 into the third period Brady Matson scored his first of the game, unassisted. Just 2 1/2 minutes later the Mavericks went up 4-0 on a goal by Ryan Cook, assisted by Matson. Four minutes later they combined for another goal, this time Cook setting up Matson for his second. Bassano spoiled Flobert’s shutout bid with the Stars only goal with 8:39 left in the contest. The Mavericks weren’t finished scoring yet and Wilfred North Peigan notched an unassisted marker just 49 seconds after the Bassano goal. With 6:29 remaining Matson completed his hat trick to make the final score 7-1 in Fort Macleod’s favour. Tyrus White Cow assisted. Flobert made 19 saves in the win, while the Mavericks fired 38 pucks at the Bassano goal. 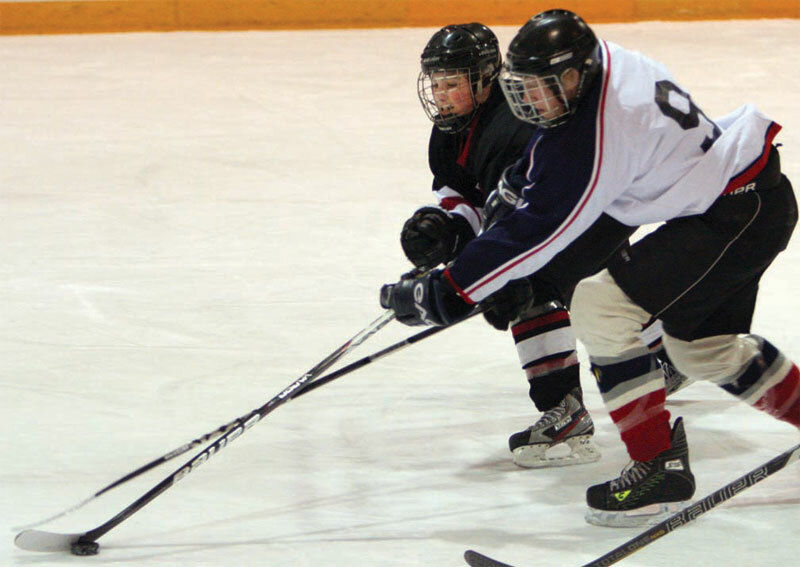 Their sweep of Bassano advanced the Mavericks to the best-of-three finals against Beiseker Blazers, who had knocked out High River Rangers in the other semifinal series. 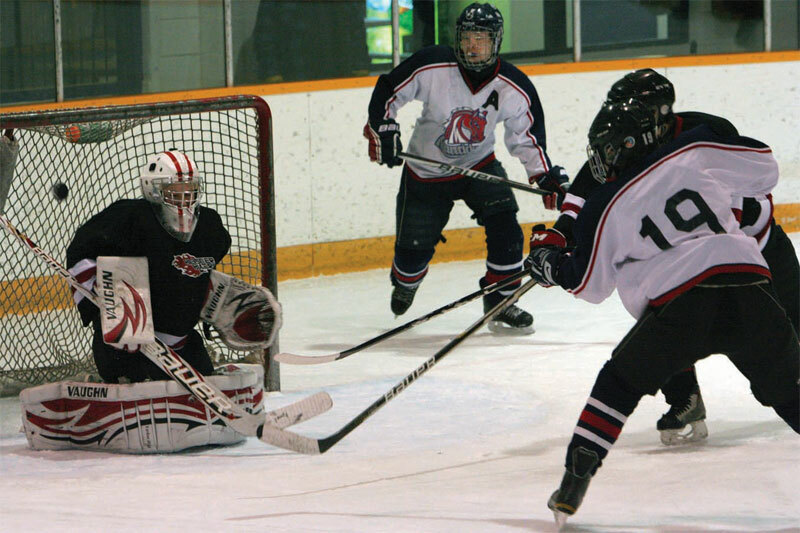 The two teams had not met since January, where Fort Macleod had earned a win and a tie against the Blazers. The Blazers got off to a quick start Sunday afternoon, as Jager Uffelman and Carson Kielboer found the back of the net in the opening four minutes. The Mavericks weathered that early storm and got back into it just over a minute later on a goal by Gallamore, assisted by Nick Maskowitz and Cook. With just over two minutes left in the first period the Mavericks scored again. This time it was Cook getting the goal, assisted by Jordan North Peigan and Nick Maskowitz. Just over six minutes into the second period the Mavericks got their first lead of the game on a goal by Gallamore, assisted by Marvin North Peigan and Nick Maskowitz. Six minutes later Beiseker knotted the game at 3-3 on Uffelman’s second goal of the game, and the Blazers regained the lead less than a minute later when Scott Verbeek scored. Cook scored his second of the game with four minutes left to pull the Mavericks even at 4-4. Matson and Gallamore assisted. Fort Macleod took the lead for good with 1:45 left in the second period when Gallamore scored his second of the game, assisted by Eric Maskowitz. Just over three minutes into the third period Gallamore finished his hat track to make it 6-4, with Marvin North Peigan and Eric Maskowitz assisting. Five minutes later White Cow scored, assisted by Wilfred North Peigan, to make it 7-4. Cody Koeverts scored with 2:30 left to pull the Blazers to within two goals, but that’s as close as they could get. Jonathan Silva and Flobert split the Fort Macleod goaltending duties, turning aside 32 shots. The Mavericks had 38 shots on goal.